Traffic signals represent a significant bottleneck. As cars queue up at a stoplight, then gradually move again once the light turns green, incremental delays are introduced and compounded by this bottleneck. Exploiting new developments in communication, sensing and intelligent infrastructure systems, our opportunities for new traffic control strategies expand. Led by Gerardo Lafferriere, a professor in the Fariborz Maseeh Department of Mathematics and Statistics at Portland State University, this research applies a common concept in computer science that redistributes burdens across a system in order to even the playing field. The research team implemented this network consensus approach in a MATLAB simulation module to explore the potential benefits to traffic flow. This exploratory model seeks to understand the dynamic shifts in the number of cars waiting at each traffic signal, including the impact of sudden changes in traffic flow patterns on overall congestion in the grid. The consensus approach was able to distribute traffic more efficiently and kept the load on all streets at a comparable level. In short, with a “smart city” technology approach we can be more responsive to change. The research team created a graphical user interface (access on GitHub) that lets the user visualize the simulation runs in an easy-to-understand environment and provides direct access to a number of simulation parameters. Some can even be modified “on the fly” while the simulation is running. 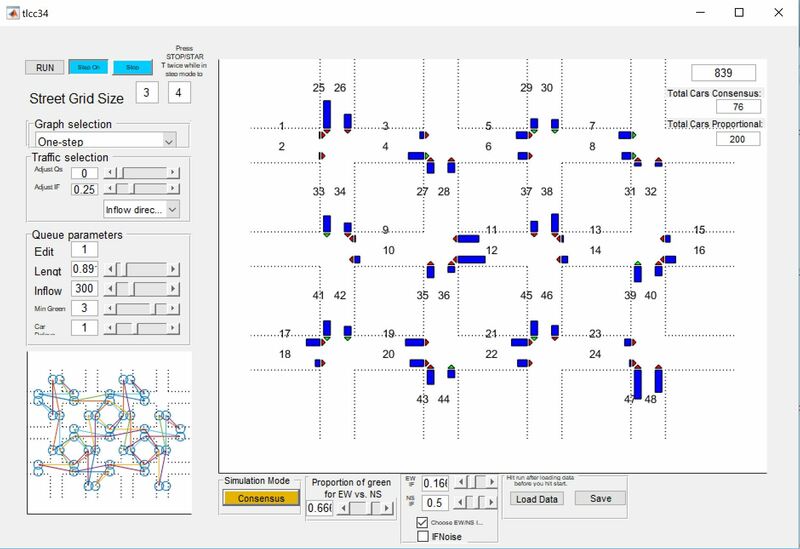 Researchers also provided simple tools to analyze the simulation results offline. With the simulation tools created in this project, other researchers in traffic management can explore the potential of the network consensus protocol. The complete open source for the code is available in the online depository. The code is in the form of MATLAB files with extensive comments explaining the various parts of the model. This research was funded by the National Institute for Transportation and Communities, with additional support from Portland State University.